Sri Lanka Tuesday prevented media from covering the court proceedings when the President’s brother, Secretary to the Ministry of Defence, Gotabaya Rajapakasa was cross-examined by Lawyer MA Sumanthiran. Yesterday, the defamation case filed by Gotabaya Rajapaksa against Lasantha Wickrematunge and the Sunday Leader on its reporting on MiG 27 purchase by the Defence Ministry was taken up at the District Court of Mt. Lavinia before Judge Gihan Ranawaka. Earlier Gotabaya Rajapaksa gave evidence-in-chief on the 22nd of May. The Cross Examination was started on the 27th May by Lawyer MA Sumanthiren. In a strange twist the Police debarred media personnel from entering the Courts to cover the proceedings. On earlier occasions it was evident that an entire media entourage was encouraged and prosecution Counsel Ali Sabri PC was seen and quite openly giving TV and Press interviews to the media within the court premises and these were widely broadcast. Some journalists frustrated by these unlawful orders were curious to know whether the District Judge was aware what was going on within the courthouse. In a recent article published in the Colombo Telegraph, Dr. Thrishantha Nanayakkara claimed that the Ministry of Defence calls on academics to sit on Technical Evaluation Committees for defence purchases, gives them less than 24 hours to review documentation and then finally blames academics when things begin to go wrong. In his article, Dr. Nanayakkara notes that it was very unfortunate that the Ministry of Defence itself took to exposing the names of professionals and the recommendations of those TECs when things went wrong. “It seemed to us that the professionals who were kept in the darkness whole throughout the TEC process were just used as a cleansing shield in the event things go wrong. I am not alone in this concern. One can check with any academic in the University system in Sri Lanka on this,” he explains. For sure they don’t want press to see, Lawyer Sumanthiran asking questions in English, and US citizen GoRa using a translator. There is no freedom of speech or RIGHT TO INFORMATION in the miracle of Asia! Why has the UNP not filed a case against the Hambantota Mayor for attacking a group of MPs in Hambantota? Is the bloody UNP opposition brainless and asleep. Ranil Wickramasinghe is a CURSE on the UNP and Sri Lankan DEMOCRACY. People expects a strong opposition and blame Ranil for not having it. But People did not vote for Ranil’s party UNP, that is why opposition is weak. They voted the current parliament and when things go wrong without taking responsibility blame the opposition. when voting people need to think far and vote judiciously. I do not think that will happen even in the next election. Majority of Sri Lankans are not matured and educated enough to vote properly. Majority of Lankans struggle to make ends meet, so they will vote for the party that appears to benefit their community the most, even if they are knowingly or unknowingly trading in their fututr for a meager short term relief. Most Lankans are also brainwashed by religion and prone to superstition. To make Sri Lanka a better place, religion needs to be booted from the political arena . Rationalism and critical thinking should be taught at all schools from a young age. The newspapers in England supposed to be the seat of Free Media are seeing many of their journalists getting jail sentences for the same tactics Athas and Lasantha used. Ever heard of Rupert Murdoch and his phone hackers and police stooges who leaked news to the media? If their is proof against anyone the pay the price when they are found out. Dodo, the UNP MP’s made a police entry on the very same day against the hambantota MP. Under’yahapalanaya’ there is no political interference or pressure. The police have to investigate. Thats the difference between the previous & former regime. Sorry Ally…. I don’t know much about GoRa. All I read in newspapers were that he runs a white van rental company and he imports dogs from swiss. That I think is more than enough to see how dangerous the creature has been. People would not chase away seeing cobras but GR. That is the real nature – please ask yourself around, why the masses stay mum in colombo vicinities. Being out of the country, I raise the question, why the many including educated masses stay mum even if UNP mps are treated as if they are fray dogs trespassing their yards. Muslims are being attacked by all abusive language with police standing as if they are thrilling onlookers of a soccer match for example. Nothing is done sofar in terms of the largest amount of drugs alleged to have imported with direct mediation of the PM office. People, it was not just MP´s office, but PM of the country had involved in that matter. Muslims are being attacked, painting the picutre as if the story of a vesak lantern/pandol. This is the cabon copy of the most dangerous MR regime inherited us to this day. Ally W – There is no need to sling mud at this bugger. He has enough MUD!! Your right without the knowledge of English could he have been able to work the 7 Eleven counter? This is the most hilarious statement I have heard recently. So why don’t you tell us about the knowledge of this White Van Abductor. This Bugger cannot even face an interview who told the world renown BBC that ‘we will hang him’ to the General who saved the country. This same uncivilized so called civil servant yelled third class obscene & filth language over the phone to another journalist, who had to leave the country fear of her life. Highest qualification of this Civil Serpent is GCE O/L. You, Ally Weerasinghe is a TOP CLASS dummy, nincompoop, dimwit dork. You may be right. Then why are you writing in this forum? @ally weerasinghe, what knowledge does this petrol station operator have? He has is Ph.d in assassinations maybe? You are talking through your pukka again. You call this third grade educated buffoon from hambantota a genius? People like you vote these 3rd class thugs into power to keep this country from moving forward. Sit there and sell hatred towards the minorities and some minorities will also do the same towards the majority. This will make the country progress……….not really!!!! English is not the language of every American citizen. Obviously you are not aware of that. Mo judge in his right mind will dare convict Gotabaya. The exclusion of the media is to prevent true details of the evidence which is being,and will be, led in court.. Brother Prince got the deal money. Now the libel Money against Sunday Leader. Then, if the TEC Guys (and Judge) want to survive, they better start to bank roll some more it in time. Otherwise ……. The main reason of shutting out the media was to avoid the insult to pride of the Royal Family. That is “Is there somebody has the guts to question the Gamunu’s Brother Prince? ; After all, Is it by a TNA Demulu? ; Is that all effort put on the Mullivaaikkaal wasted? ; After a humiliation like that, Can the Royal Brother Prince face Mahavamsa voting Heroes in the next election? “. If you are in doubt please ask others. We are here to help you. @siva sankaran sarma the idiot has spoken again. The world cannot be fooled. This is the true situation in Sri Lanka. UN, AI, HRC and other relevant authorities please take note. Has sumanthiran selected the plot of land for his burial site like Dr.mervyn.I hope he does not go there and cry like DR.mervyn silva. This is the same man who asked a journalist who is Lasantha Wickremathunga pretending not to remember who he was and also to demean Lasantha as an unimportant nobody. What a charade when he had this case filed against Lasantha all the time. If the judge has any backbone he should dismiss this case. he was being sarcastic when he asked who lasantha wickramatunga was how can anyone not know who lasantha is but it is a very good point you made the majority of sri lanka will name him as the main suspect but this is for sure proof that he had always had a motive to kill lasantha and showing the history between them shows he is the one behind it. NPA Guidelines requires all TEC members to be well experienced professionals or people with a very good knowledge in Procurements and Section 8.1 has given blanket powers to the TEC even to override the Cabinet approved Tender Board Chairman. What Crishantha has stated about the exposing of the names of TEC members are correct, but when Gotabaya is in a very tight corner he will do anything to overcome the problem. MIG 24 deal is very fishy as the Ambassador Weeratunga did the negotiation well over the actual cost the MOD paid for the 4 MIGs and the other three trainers. If Sumithitharan need Expert Advice on NPA guidelines and about this MIG deal I am ready to provide him with thatProfessional advice. The cost of the MIGs may be HALF the cost quoted by the Ukranian suppliers. Otherwise how come Gota become a billioner? any evidence for that or is it rumour? How come Mervin Silva became a ferrari owner ? How come Wimal weerawansa became an owner of a mansion just having had the chance to work as a minister since 2005 ? How come CESPIT MOUTHED that cricket minister – be affordable to become a rich man ? How come many others including Rajapakshe offsprings to wear only 1000 dollar pair of shoes, though Namalbaby´s mouth is seen as if he never was treated by a dentist (lacking lower jaw teeth)? leela,we are talking about gota here,not the others. Once before, this bugger Gota in Courts holding his mobile up shouted at a witness in front of the Judge from the dock, completely disregarding Court and the Judge just kept quiet. Had it been another, would have been charged for Contempt of Court. Here too, the case is pursued just to acquit Gota of all charges to show his innocence after being involved in the scandal, just like how MR was cleared from the Tsunami robbery. Only if Lasantha Wickrematunge lived today would have undressed this Hoax in Court. Bloody [Edited out], the whole Rajapassa family is. The photo of GR looks as if his collar is getting too tight for him! dont worry – there are enough laundry men there to starch iron it. Rajapakshe devious agendas have been injected to the stupid folks cementing them on their facal filled heads. This is the modayas world – though MOdi is predicted to become and another Gandthi to the world. I mean, is He thinking of the Hangman’s Noose that will come his Way soon? Is Mt.Lavinia District Court Judge Gihan Ranawaka a relative of the Hela Urumaya man Champika Ranawala? Big brother and the litters must be furious that they didn’t get a fair share from dirty deal…. Then, what about the poor man who thinks who runs the economy successfully, at least his own? In the definition of democracy of MaRa, is it nonsence to talk about the Media, Journalists, Corruption, Intimidation, Extortion, Court of Law, Jungle Law and you name it…….. Paid more or less, it did the job at the right time to sink the terrorists & eradicate the menace. Why did not Chandrika or Ranil bring in the MIGs and finish off the terrorists much earlier intead of bringing in French locomotives. Ranil’s crude Batalanda tactics were no match for the ltte and succumbed to Bondevik’s manuvoers to demarcate & sell the country and for him only to dip into the pocket of the special assignment given to him in some organisation of democratic something established by Norway and Ranil being appointed its Vice President. WHERE IS ARNE FORJET THE LEFT WING NORWAY POLITICIAN, TROUBLE SHOOTER AND PRINCE OF JAFFNA ? This is an illegal practice and police personnel who used their titles to interrupt the journalists and work to safeguard this corrupted political appointees must be dealt with maximum punishment under a future administration. People and the law always above the politicians. They didn’t respect the constitution and the law means, they are not serving the people. Entire police department in the country needs to restructuring process and undergo intensive training. We have to live in a country where our administration base on values , ethics and good governance. This state of paranoia politics become a more and more headache than a warrying. Not one person has the right to criticise Gota. Sri Lankans always easily forget the great thing he did for Sri Lanka in defeating terrorism. No other Defence Secretary managed to do the great things for Sri Lanka like GotaRa. Every UNP Govt that came before stole from the country. This Govt is the first Govt that has improved Sri Lanka. Shame on all the silly UNP suppoters for forgetting the great things that Gota did for Sri Lanka. Shame on all you UNPers and other Terrorist supporters known today as Ealamists. I am hoping that CT will publish the court proceedings and evidence including transcripts of the cross examination. Gotha worked in a Petrol Station in the USA and then turned his hand into business. But soon after his brother was elected as the SLFP leader he returned to Sinhala Lanka as a failed businessman and made his millions from dodgy deals and built the ” White House” in the heart of Colombo City. From the loot he sent money to USA and bought a Mansion for millions. The USA authorities under Money Laundering Rule raided his house and want to know how and where he got the money from. The following is a continuation of the Long Arm of the American Law enforcement to catch people like Gotha. A resolution received by the Congress in Washington DC last Monday calls upon the Obama administration to “place restrictions on the entry to the United States for anyone it identified as responsible for war crimes and crimes against humanity” in Sri Lanka. Countdown: 80 days to go. There is no need for TNA for the time being. MR has been ordered not only to implement 13th Amendemnt but to go beyond it. We are going to have Police and Land Powers and that means we are going to have IGP appointed by the CM. BJP relaesed a statement to that effct but MR has denied that it was ever discussed. You are an intelligent man ( I hope) and I leave it to your imagination to work out where MR is heading. In the direction of CRIMEA. No I am not and I am bit thick. I am disappointed. Cant’t just you invite Tamil National Army (TNA commander chief Amma) to entertain us? It’s a joke to seek justice through courts in Sri Lanka. All Judges are selected Rajapakse coolies after given them Duty free Mercedes Benz cars. Mt.Lavinia courts is no exception. How come Gota has so much powers to stop media from court proceedings. Infact they were not allowed even to take photos of Gota’s motorcade.Who he think he is after Jailing Gen.SF for two and a half years on falsifying arms purchase charges. The truth has to come out irrespective of how powerful Rajapakses are. How come Gota has so much powers to stop media from court proceedings. Infact they were not allowed even to take photos of Gota’s motorcade. Who he think he is after Jailing Gen.SF for two and a half years on falsifying arms purchase charges. I hope that the facts in the Sunday Leader page quoted by you will be a part of the evidence submitted at the trial,and,that the judge allows it. I believe it was sripathi sooriyaratchi and mangala who made the complaint against gota to the bribery commission.The sunday leader reported this fact and gave the background for the reasons for the complaint.So i’am a bit confused as to why gota is going for defamation against the sunday leader which is merely reporting the complaint made against him by the two parliamentarians.He should be filing action against them.Unfortunately sooriyarachi was despatched to the netherworld with the usual ‘accident’so can’t get damages from him. Mangala could have been dealt with when he tries to throw a grenade at the police. Waste of taxpayers money with all these court cases. it suits him is a possibility. no Court verdict will ever be made. Time has come for True Sri Lankan Lions to safeguard Sri Lanka not from Tamil Tigers, but from the so called Buddhist Sinhala Racist Political thugs who divide Sri Lanka on Race and Religions lines. Now the so called Buddhist Sinhala Political Monkeys and donkeys have become the Lords of the Jungle. But the true Sinhala Lions will get the country back from Sinhala Policical Donkeys and Monkeys who think they are the Lords of the Jungle. It’s time to take Sri Lanka back from these gone crazy uncivilised, uneducated and uncultured Monkeys and Donkeys. Justice has been served on those who defamed Kothapaya already! 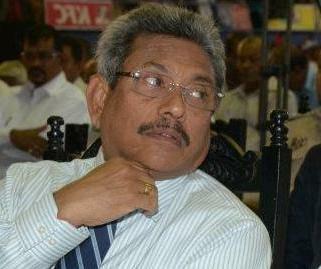 Gota was really enraged with Lasantha because he referred to him as a GOAT.